Facebook/Freshfields Animal RescueThis cutie isn’t going to be lonely for much longer. “Transformers: The Last Knight” has a furry new cast member. Director Michael Bay announced that Freya, dubbed “Britain’s loneliest dog” by the Mirror, would have a role in the fifth “Transformers” film. 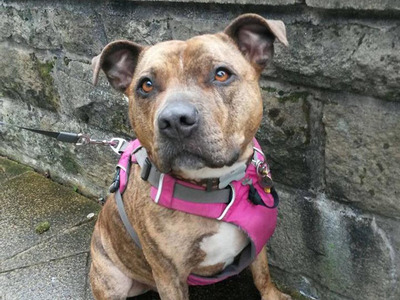 Freya, a Staffordshire bull terrier cross, suffers from epilepsy and has been living at Freshfields Animal Rescue for six years. She was taken in as a six-month-old stray and has been rejected by 18,000 possible owners over the years. Bay said that if she was unable to find a home in Britain, he would adopt her himself, and give her a part in the next “Transformers” film. Since Freya has gotten media attention, Freshfields Animal Rescue said that they have received interest from people around the world. Looks like this lonely dog won’t be lonely for much longer.